Leave notes for your peeps, notes for yourself, decorate your table, keep kids busy during meal prep, play games, practice spelling and math problems, doodle, draw, create, USE YOUR IMAGINATION. There really are so many possibilities to the chalkboard place mats. Elsie from the Lilly Brush told me that she likes to write questions on each place mat. Then, during dinner, you get to answer the question on your place mat. LOVE THAT! I also like to pick a number and a direction. (To the left or to the right.) Then, count that number around. Whoever you land on, write something nice about that person. It's really great when they land on themselves. 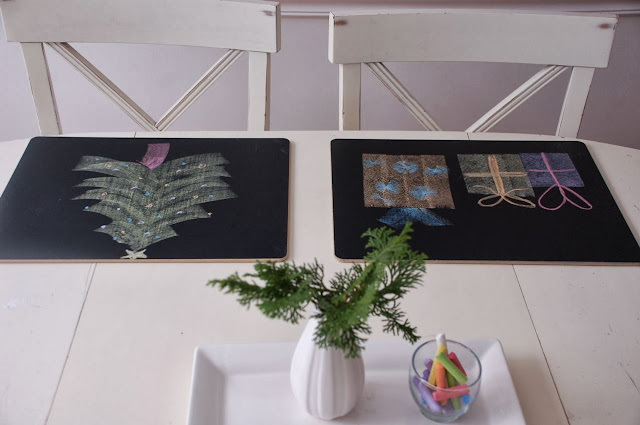 If interested in receiving a set of the chalkboard place mats, please leave a comment here before Monday, December 16, 9am EST and I'll have the random number generator choose a winner. I've always wanted these! Thanks for a chance to win. I sent these to my brother's family when you first offered them for sale. They love them and my daughter has always been jealous that we didn't have them. Thank you for the chance to win these. Love those fun ideas. :) My kids would have a great time with these placemats. These are great! Would love to win these!!! That's such a great idea. I could have such fun with them with my grandsons. Oh I love these!!! What an awesome giveaway. Thank you for the opportunity!! My nieces would love that! Pick me please! I have loved these place mats since the very first time I saw them on your blog! Thanks for doing a give away!! I just purchased a set for my grandchildren (ages 2 and 5) and gave them just last night as an early Christmas gift. They absolutely love them...and I would love to have a set here for them when they visit (which is frequently!). They are beautifully made and I can think of so many uses for them! Thank you for such a generous gift, Leslie! These would be wonderful for my great nephews! What a wonderful idea - I love it. Thanks for such a cool giveaway. How fun! Please put us down!! I really like these placemats and all the clever ideas for their use. I would love to leave notes for my family on these - thank you! What a great idea. Bet it's fun at teatime!! What a simple and brilliant idea. I wonder if it would even get teenage boys talking?! I have been keeping my eye on these for a while, just finances have not allowed their purchase. These are wonderful! We use them all the time for menu planning, doodle warring, chore listing, happy day wishing... Alas, we have used them so much over the last few years that we could really use a nice new set! These seem like such a great idea! Keep the kids entertained at the table. Oh, who am I kidding! I want them for me! Oh, please pick me. I think these chalkboard place mats are genius! i love all of those ideas! These would be a fun addition to our table! I've admired these placemats for years. Thanks so much for the chance to win a set! December 13th is my birthday so perhaps fate is in my corner! I love our mats and appreciate the various suggestions I have gleaned about fun uses. We mark ours as place cards. This idea is so creative! Thank you for being so generous! It's my birthday today, and your good spirit lifts mine. Happy Holidays! I'm interested! Those look so neat! I LOVE these!! Thanks for a chance to win! What fun! I love the idea of writing out a question. Thanks! I've wanted these for a long time. Thanks so much for the chance to win! Merry Christmas! such a fabulous idea... genius, you might say! thanks for a chance on these. my kids would be thrilled! I've always loved the chalkboard place mats! Thank you for your generosity! It's so good! I'd love to win it! What a great idea! I bet kids love these so of course I want some for my nieces and nephews. These would be wonderful for the children in my life. You hit the nail on the head with these, Leslie!! Thanks for the giveaway! Merry Christmas!! I would love a set of placemats! Thank you for teh contest ! These would be wonderful for my kids ! These would be great for my little one! Another awesome giveaway! Thank you! Merry, merry! I have looked at your chalkboard placemats for a long time. I would love a set of my own! These placemats are a fantastic idea! I love that you are offering up a chance to win them! Great giveaway. These would be great for my kids. They are just learning to write and doodle. Thanks. These look like they would be so fun! Such a great idea! I'd love to use these in my after-school club. Love the ideas you presented. I think these would make a great housewarming gift for a young family. I'm dying, dying to win those placemats!!!!!! My kids would love them! these would be so fun! i'd love to win them!!!! My three kiddos would love these! All the fun ideas you've shared on how to use them sound great. Such a fun idea. My family would love these at meal time, homework time & all other times! We would love a set of these - thanks for the give away. What a great idea and a fab product! Thanks for the chance to win. I've been admiring these. So happy to have a chance to win them! Chalkboard placemats! What a fun idea! Just think of the possibilities we could have with these! Leslie, I love mine but would love to win some more for when company comes! I gave a set of these to my nephew and his family 2 years ago. They still tell me how much they love them! I would love to win a set for me! I'd love to win a set of these! Love these, thank you for the chance to win! I love the chalkboard placemats and would love to use them in my new apartment! Thanks for the opportunity! These are so much fun!